Apart from Château Grillet, St-Peray, and that Vioginer temple, Condrieu, – which are the only cru appellations to have 100% white production – the region is overwhelmingly red, with darkly spiced Mediterranean grapes like Grenache Noir, Syrah, Mourvèdre, and Cinsault accounting for 80% of production across the Rhône Valley and it satellites in 2017, leaving 13% for rosé and just 7% for white. However, this red-dominated landscape is far from static, with a growing emphasis on whites gradually creeping out of vineyards. 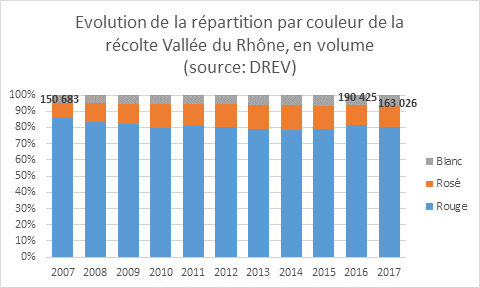 According to the region’s promotional wine body Inter Rhône, whites still only account for 6% of the total of Rhône Valley sales, but this has doubled compared to ten years ago. The Rhône Valley’s white production has increased by 8% over the past ten years, with production growing at regional Cote du Rhône level up to the crus. For example Lirac, which produces distinctive wines from Grenache Blanc, Bourboulenc, Roussanne and Clairerette, has gone from strength to strength on the reputation of its whites in recent years, with production rising from between 2% and 3% ten years ago to 10% today. Lirac might be a notable example, but the shift is noticeable across the region, with a recent trip to the southern Rhône revealing a roster of fruity, crisp, juicy wines made from Rousanne, Marsanne, Viognier and re-emerging local star, Clariette. Cellier des Dauphins, the Rhône’s largest coop and the third largest in France, revealed to Harpers it had been enthusiastically planting 100 ha of white grapes over the past year: a mixture of Marsanne, Rousanne, Viognier to the north of their sprawling base in Tulette, where they can bottle 2,000 units an hour. The investment is not insignificant, considering the backing behind it. Cellier des Dauphins, which – together with the 11 coops it presides over – represents 30% of Cotes du Rhône AOC production and is a powerhouse in the UK off-trade. The Rhône is indeed a force to be reckoned with. Its 2.5m hls of red, white and rosé production last year puts it only behind Bordeaux, which eclipses everyone with 3.5m hls a year. And with climate change in the vineyard and macro-economic factors bearing down, it’s clear why producers are looking to become more agile. Not only are bad harvests becoming more frequent, the weather is becoming more extreme. According to Thomas Giubbi, co-president of the Côtes du Rhône AOC, the harvest in 2014 and 2016 was the best the region has seen in a “long time”, reaching a high of 3.1m hls. Things unravelled again last year however, when harvest dipped to a seven-year low of 2.5m hls. “There was no rain between May and November in 2017, but this year all we had was rain,” said Giubbi. Stock management in difficult years of increasing frequency is also on the minds of winemakers like Rodolphe de Pins of Château de Montfaucon, which faces Châteauneuf-du-Pape, just across the Rhône River in Lirac. For de Pins, having a mix of red and white is helping with the task of meeting with supplier demands, with whites – which can be released early – making up for supplies in low years. A focus on whites is also part of a shift to improve the overall quality and image of the area, with an investment drive going into vineyards over the past decade or so. As market tensions including Brexit impact prices, producers and Inter Rhône – the interprofessional body which promotes them – are more aware than ever of the importance of diversifying. Figures show whites are doing well domestically in France and particularly the supermarkets, where sales are up 15%. Now, Inter Rhône is aiming to target the independent trade with whites and organic wines. Organic vineyards represent 16% of the total in the Rhône Valley – the largest area in France (the Languedoc has a higher percentage but smaller surface area). Although, it will take a while for any push on whites to translate into UK sales. In UK supermarkets, Côtes du Rhône AOC wine sales are 94% red, 4% rosé, and 2% white. Further up the pyramid, Côtes du Rhône villages and also the crus, white is even less represented: 99% is red, while 1% is rosé, leaving almost no representation for whites. However, Inter Rhône and its producers still have their eye trained on the UK market, where wine conmsumption is split 50/50 between white and rosé versus red. The food-matching capabilities of white wines like 2016’s Clairette 99% and 1% Grenache blanc from Séguret’s Domaine de l’Amauve, also puts producers in good stead for matching up with international trends. The Rhône Valley is arguably in a good position. Red vines typically need over ten years to grow and mature, whereas whites can be ready in three. Although as ever, the Rhône, like the rest of France, is one of the slowest regions to adapt, with a historic cooperative/negoicant system and long-standing appellation laws meaning that significant change could be a while away. One need only look south for comparison. While Italy has been planting 1,000 ha a year for Prosecco, I’m told the Rhône Valley could legally plant up to 150ha a year, although annual plantings fall far below this.